Yoga Moves - Yoga Moves Welcome! What Makes Yoga Moves Stand Out? Our amazing community, our supportive and talented teachers and our beautiful space that invites you to create your own experience. ​Whether you are looking for calm and compassionate, energetic and powerful! We offer classes for everyone at every level in every body! 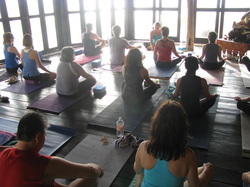 Beginners to teacher training we have it all at Yoga Moves. Is QiGong good for Everybody? Click below to view a video from The Omega Institute. We offer a wide variety of classes at Yoga Moves; something for everyone at any level, hot or not. We have classes for fitness, relaxation or a combination. Just the right one for you to chill, recover from an injury or get into shape. In addition to our regular classes we offer a huge variety of workshops. 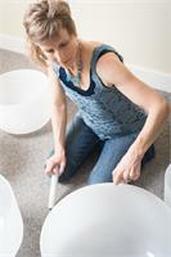 Restorative Yoga, Meditation, Crystal Bowls, etc. As well as fun events. CranioSacral Therapy is a light touch modality that focuses on releasing restrictions in the dural tube (from the cranium to the sacrum) which effects the whole body. It also works with the fascia (the body's connective tissue) to release facial restrictions. This work encourages the body to heal itself by bringing it back into balance.